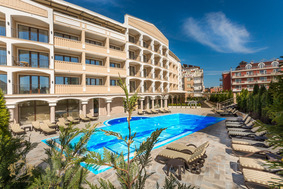 Location: Siena Palace Hotel is located on the main Iglika street, a 3-minute walk from the sandy dunes of the North Beach in Primorsko. Accommodation: The hotel offers 77 deluxe rooms and 2 suites. All rooms feature balconies overlooking the swimming pool or the city. Room facilities include individual bathrooms, TV (50 TV channels and 6 music channels), telephone, air conditioning, personal safes. Bars and restaurants: The hotel offers a lobby bar and a restaurant with a garden. The restaurant offers varied international cuisine from 7:00 am until midnight. The lobby bar serves drinks and snacks 24 hours a day. SPA center: The hotel's spa center features a sauna, steam bath, massage cabinets, jacuzzi. An outdoor swimming pool with sun loungers and umbrellas and a fitness center are available, as well.